Jenny’s practice allows her to work with a variety of clients, from large businesses to individuals. The majority of Jenny’s practice consists of handling workers’ compensation cases for employers, specifically in large production settings. It would not be unusual for her professional attire to include a hard hat and steel-toed boots when visiting work areas on clients’ premises to assist them in developing their best defenses and case strategy. Many of the cases she handles involve claims of complex, repetitive trauma injuries. 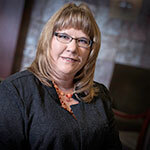 Jenny resides in Syracuse, Nebraska and works at Baylor Evnen’s Syracuse office, which was established by the firm in 1980. A self-described farm girl from Table Rock, Nebraska, who learned a strong work ethic through her parents, Jenny is pleased to serve clients in Nebraska’s smaller communities. She is active in local business and community activities. Jenny primarily assists clients in Southeast Nebraska with estate planning matters such as wills, health care directives, and powers of attorney and by helping them obtain the specialized services offered by other Baylor Evnen lawyers in diversified areas of law to address the clients’ particular needs. Outside of her law practice, Jenny can be found wearing her “Syracuse Rockets” t-shirt while supporting her three sons’ efforts in the classroom and on the football field, basketball court, and long jump pit. The Panko family enjoys showcasing their “Screamin’ Yellow” 1930 Ford Coupe at various area car shows. Jenny also enjoys heavy metal music. Among her favorite bands are Metallica, Pantera and Led Zeppelin. She published a paper entitled, “Makes Me Wonder—The History and an Interpretation of Led Zeppelin’s ‘Stairway to Heaven,’” in the International Torch Club Magazine in 2016.